Stitching on the sewing machine is wonderful. It's fast; it produces a strong seam; and even for beginners, it's relatively easy. Because of these pluses, you probably head straight for the machine whenever you want to stitch something - its efficiency is pretty addictive. But the sewing machine's virtues can actually hinder achieving good results in some circumstances. Imagine sewing the neckline of a doll's dress or the intersection of the collar and lapel on a notch collar jacket. It can be awkward (or downright difficult) to get the garment up under the machine's presser foot. Or imagine sewing a velvet bodice onto a satin skirt. Even though the waist seam is easily accessible, the sewing machine's presser foot and feed dogs can make one layer of the garment slide in relation to the other, which makes it a chore to match bodice and skirt seams exactly. Hand basting can make even the toughest sewing jobs much easier. Even if you hate handwork, don't discount the value of hand basting. It surpasses pin basting in accuracy and control. A few hand-basting stitches allow you to conquer a difficult sewing situation with relative ease. Two tries, then hand baste. If you pin baste and machine sew a seam once but are not satisfied with your work, stop and assess the problem. If you lost your concentration or were in a hurry, then a second try with pin basting and machine stitching makes sense. But if you've tried your best to control a seam twice and are still having trouble, hand basting is the solution. Don't assume that hand basting is necessarily the slowest way to get a finished product. Pin basting, stitching on the machine, then taking those stitches out - if you repeat that sequence three or four times, you could easily spend a half hour or more on a small seam. Using an example from above, it would take less then five minutes to hand baste the neckline on a doll's dress, plus there won't be pins to sew over or get pricked by. Target specific areas. Rather than hand basting entire seams, frequently all that's needed is to hand baste the trouble spot, such as the intersection of two seams. Difficult-to-handle fabrics. Hand basting is the ideal way to control difficult fabrics. If sewing on velvet drives you crazy, a quick hand basting will make it a snap to sew. It's also a great way to control chiffon or charmeuse, which have a tendency to slide out of place. 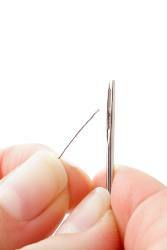 Use a fine hand needle. Whether you use a sharp (long) or between (short) hand-sewing needle is personal preference, but do use a thin needle with a small eye, which won't leave needle marks (holes) in the fabric. What kind of thread to use. Silk thread and a fine needle rarely leave needle marks, even on delicate fabrics. Because silk thread is slippery, it's easy to remove once the machine stitching is completed - just be sure to hand baste securely. Any other thread can be used as well, as long as it can be removed and won't mar the fabric. The next time you get frustrated because you can't get seams to match exactly, or the fabric you're working on "crawls," or what you're sewing requires a lot of precision, reach into your bag of sewing tricks and rely on a few hand basting stitches to help you get the job done.